What a deal! Get Adobe Production Premium CS5.5 with a free upgrade to CS6 for just $1,499*. That’s $400 savings on the price of Production Premium CS6! What a deal! 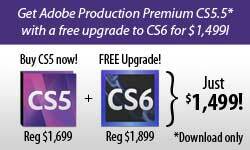 Buy a new license of Adobe Production Premium CS5.5 and get a free upgrade to CS6 for just $1,499*. That's $400 savings on the price of a new license of Production Premium CS6 (regularly $1,899). This sale ends when Adobe CS6 ships. Edit more fluidly with a streamlined user interface in Adobe Premiere® Pro CS6—the hub of your professional video workflow. Freely iterate on your creative ideas with the new Content-Aware tools in Photoshop or by leveraging new 3D advancements in After Effects.® CS6 Production Premium also introduces new tools that solve common post-production challenges: Adobe Prelude, a logging and ingest tool, and Adobe SpeedGrade, a forward-looking approach to color grading. Sleek Adobe Premiere Pro user interface — See more of your video and less clutter, thanks to an efficient, highly intuitive interface featuring customizable Project panel views, transport controls, Audio Meter panel, and track headers. Play clips directly in the Media Browser. Global Performance Cache in After Effects — Create more in less time. After Effects intelligently optimizes and preserves your previews by taking full advantage of the 64-bit power in your computer’s hardware. Now you can beat deadlines instead of waiting for frame updates. Photoshop imaging magic — Retouch images with new Content-Aware tools. Experience fast performance when working with large files using the new Adobe Mercury Graphics Engine. Creative tools in After Effects — Track elements in 3D space with depth of field, shadows, and reflections, and apply 3D track points to 2D footage. Extrude fully ray-traced text and shapes natively while adding reflections, environment maps, and more. SpeedGrade for crafting the perfect look — Manipulate light and color. Broad format support includes RAW, HDR, and stereoscopic. Apply precise HDR grades to source, or import media from Adobe Premiere Pro for more in-depth color grading. Faster audio editing in Adobe Audition® — Get high-performance and intuitive audio editing. Powerful new tools such as automatic audio alignment, real-time clip stretching, pitch and speed control, and control surface support help you deliver projects faster. Logging and ingest in Adobe Prelude — Ingest nearly any file-based format and begin logging immediately with searchable temporal markers that flow through post-production, enabling you to work faster and stay organized.